Draftsmen looking for exceptional ergonomics and comfortable seating need look no further than the Inertia Mesh drafting chair, from Allseating. This chair features a mesh backrest for better airflow, as well as a heavily padded cushion with a waterfall edge for better comfort. The seat and backrest are deeply contoured for more support. This drafting chair also features pneumatic style seat height adjustment, fully adjustable arms and 360-degree full rotation, a nylon star base, and carpet casters. Options include hard floor casters. 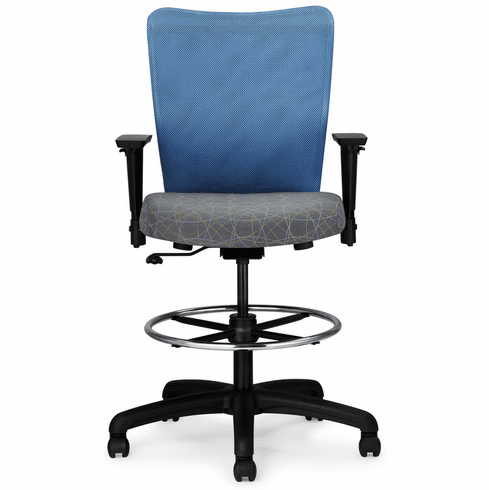 This chair is rated for 325 pounds, and meets or exceeds the ANSI/BIFMA standards for durability, safety, and comfort. With eight mesh colors for the back, and over 50 fabrics and vinyls to choose for the seat, you are sure to find the perfect chair to match your décor! These Allseating chairs normally ship in 3-4 business days from Toronto CA.